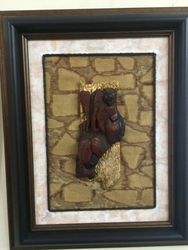 It is fully made by wooden and then covered ceramic, clave and oil paint color. It is wall hanging for decorate your home. (Vastu shastra Wall hanging). Spruce up your wall with this primeval mural made of wood with smooth curves. It comes with a base to enable placement of anything on it. Its artistic curves are sure to ornament your wall. Since our commencement, we are immersed in presenting an elite array of Wood Mural Art. 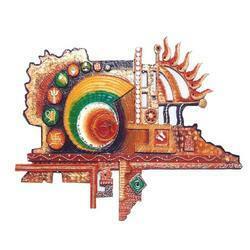 We are a noteworthy organization in this domain, occupied in providing pristine quality range of Wood Mural Art. Our provided product is crafted as well designed under the guidance of our deft professionals using the optimum quality and sophisticated techniques. The offered product is broadly used in hotels, resorts, houses, etc places. This is a customised wood mural of Shrinathji created by us. He is a one of the avatar of Shri Krishna and supposed to always be dressed richly with lot of jewellery. Very Attractive Vertical Ganesh OM Wooden Mural. Size 10 inch x 24 inch. • 1000 Rs to 2200 Rs / Pieces. We have carved a niche amongst the most dominant names in this business, offering Wooden Murals to clients. These Wooden Murals are made by using superior quality wood which we buy from our trusted vendors. Furthermore, to attain the maximum satisfaction of customers, we provide our product at most affordable rate. Our company has accomplished to shape a position in the marketplace for offering Wooden Mural with exceptional quality.